The customer service was excellent, he was engaging and very knowledgeable. Great Service Great Deals nothing but awesomeness This is my second purchase with World Hyundai my sales people Chris and Edwin went above and beyond to help me out always a great experience will definitely refer anybody i know to these guys. This is my third purchase with World Hyundai my same two sales people always great service i really appreciate everthing you guys do everytime you guys do it thank you so much Chris and Edwin anyone looking for a car this is the place to go ask for Chris and Edwin !!!!! Always a great atmosphere. This is the second car i have bought from frank. Every experiance has been great. Always friendly and straight forward. I wouldnt want to work with anyone else when it comes to buying a car. :) couldnt be happier! Both Erick And Chris were quite professional in customer service, attitude and consideration of our (me and my mom's interest). he was very open with how the deal would be done, my options of how everything works. My overall experience here at the World Hyundai were good. They work with me to get me into what I wanted. 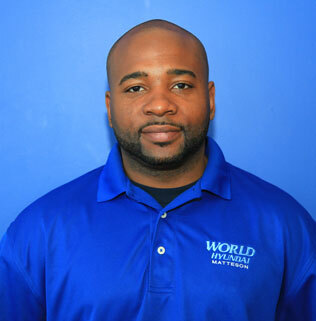 David King and Michael Jones are excellence personnel they were courtesy and very helpful and knowledgable. David was very helpful and helped me get exactly what i wanted for a good price. MR. KING WAS VERY HELPFUL AND VERY PATIENT WITH ME, HE TOOK IN CONSIDERATION OF MY NEEDS FOR THE VEHICLE BASICLY OF MY CHOICE EVEN THOUGH I DID NOT TOTALLY QUALIFY FOR THE VEHICLE OF MY CHOICE, WITH LOTS OF EXTRA EFFORD MR. KING MADE IT HAPPEN, THANKS TO THE TEAM ALSO. My experience at World Hyundai was to be honest "Life Altering". I am now a true Hyundai customer for life! Based on my experiences at World, I can fully say that I just have been buying cars the wrong way. Not anymore! Two enthusiastic thumbs up! MY SALESPERSON WAS LESTER RODGERS he treated me very well he was a great salesman very motivated and skilled in selling cars. I will recommend him to my family and friends. Got the Hyundai Elantra from World Hyundai Matteson at the price we wanted! WE LOVE THE HYUNDAI LINE AND WE GOT THE 2010 ELANTRA AT THE PRICE WE WANTED. THANKS TO KOREY AND TOM. I know you will enjoy your Hyundai Elantra. We certainly try to get to everyone to a price they feel good about.